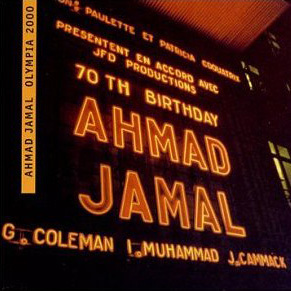 Ahmad Jamal celebrated his 70th birthday last year with a Paris concert, now titled Olympia 2000 (Dreyfus FDM 36629-2; 64:53), featuring his trio and special guest tenor saxophonist George Coleman. Jamal’s unique touch and attack are instantly recognizable from the opening vamp of “The Night Has a Thousand Eyes,” and he explores the entire range of the keyboard with his harmonically inventive solo work on “How Deep Is the Ocean?” Jamal is especially playful, even aggressive, when comping behind Coleman, and it’s fascinating to hear him goose and engage the saxophonist on “Autumn Leaves.” Coleman is also in fine form; he gets a beautiful dark sound in the lower register on “My Foolish Heart” and a cry in the upper register on “How Deep Is the Ocean?” This is a group that knows something about playing with dynamics, space and drama. 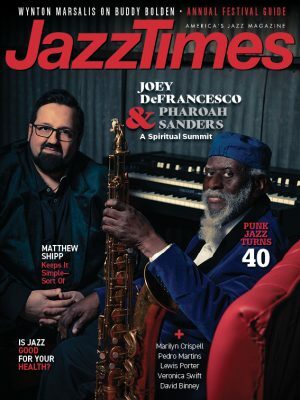 Recording quality is generally good for a live concert, though there’s a bit of distortion on the bass during the final two trio numbers, and Idris Muhammad should have been brought forward a bit in the mix.